Le Guin expanded the boundaries of speculative fiction, both by bringing it to a wider audience and by including all of us within its worlds. On Jan. 22, 2018, Ursula Kroeber Le Guin died. Most of us learned this the next day, and many of us were devastated by the news. Not all of us, of course; in response to one of countless technologically mediated wails of anguish — this one on Facebook — a man I’m not going to name noted that Ursula was 88 years old and philosophized that at such an advanced age death was an inevitable occurrence. Get over it, his words and tone implied. Yes, Ursula had become old. In interviews and stories and essays she made quite sure we were aware of that, starting 20 years ago. And I’d heard that she was ill. I should have been prepared. I wasn’t. I’m still not. I’m unable to tell you with any certainty when or how I first met Ursula. Probably at a reading at the Pioneer Square location of Elliott Bay Books. She was already wrinkled and white-haired at that point, and already a literary force to be reckoned with, her paradigm-dissolving science-fiction novels “The Left Hand of Darkness,” “The Lathe of Heaven” and “The Dispossessed” making their influential way through the world. Her short story “The Ones Who Walk Away from Omelas” was being taught in high schools across the land, challenging students with the moral dilemma behind all Utopias — in fact, behind all political systems of any sort. Other Ursula encounters followed. With Eileen Gunn (she’s an award-winning author, too) I interviewed her for a television talk show Vonda devised. At a dumpster by a restaurant where we lunched, Ursula and I discussed the intelligence of crows. I had the honor of suggesting revisions to her contribution to a literary quarterly I help put out, “The Cascadia Subduction Zone,” and being called “not just a good editor but a nice one.” I visited the Le Guins’ Portland home and petted her extremely standoffish cat; he didn’t bite me, which astonished both her and him. These sorts of moments aren’t really the point, though. Reviewing them isn’t really how to remember Ursula. They can’t give anyone reading this a proper sense of how important her life and work are, especially to me and other nonwhite writers of fantasy, horror and science fiction. Basically, she was our best and most powerful ally. She made our presence in her stories a matter of course. The brown-skinned inhabitants of Earthsea, for instance, site of her acclaimed children’s fantasy series, made people of color intrinsic to an earlier generation’s Harry Potter. The black-and-white romance at the heart of “The Lathe of Heaven” validated the realities of racism we face. Over and over Ursula showed us we were indisputably part of imaginative literature — at least as far as she was concerned. As her impact on the field increased, our place in it grew more and more assured. A common observation about how Ursula K. Le Guin affected speculative fiction is that she widened it. She did that in part by bringing it to the attention of critics in the habit of glaring disparagingly at it down their academic noses. But as far as I’m concerned she expanded it primarily by including me and mine within its boundaries. The last time I saw Ursula was at a symposium the University of Oregon held in her honor on Dec. 2 and 3, 2016. She obviously wasn’t well; she attended in a wheelchair. I thought she’d recover quickly, if not immediately. She didn’t act like there was any other possibility. So here we are, left with only what we can recall of her. I plow through obituary after obituary, remembrance after remembrance. Numerous summaries of Ursula’s life appear in major genre publications, and nongenre ones too. I read them all because they all help me understand her. Who she was. What she did. How great a woman. How excellent a writer. Internet-style memes abound, too. The most popular include a quotation from her famously fiery acceptance speech, the one she gave on receiving a medal from the National Book Foundation in 2014, the line equating capitalism’s reputation for invulnerability with that of the divine right of kings. 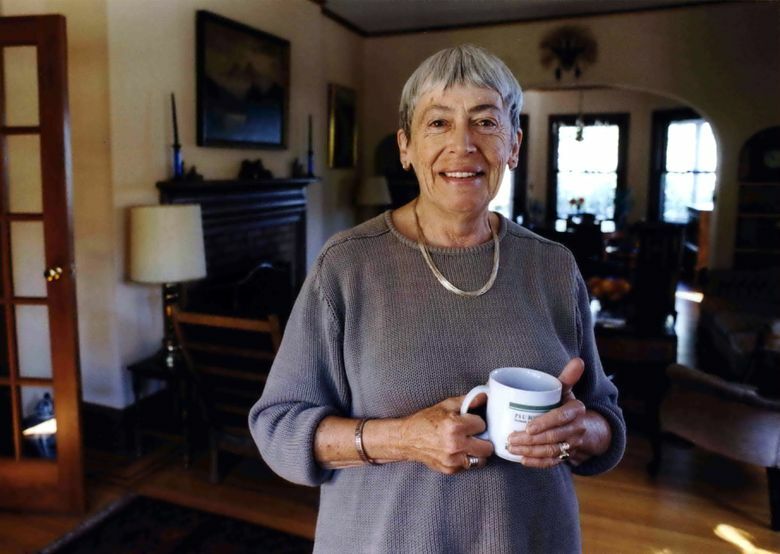 How should we remember Ursula Kroeber Le Guin? Together.